Steve Atlas is the amazing bodyweight expert behind The Body Practice, and one half of the incredibly talented Atlas Brothers. I was lucky enough to get to ask him a few questions about his training methods and work ethic. Here’s what he had to say. TELL US A LITTLE BIT ABOUT YOUR BACKGROUND. HOW DID YOU GET INTO FITNESS AND, IN PARTICULAR, BODYWEIGHT EXERCISES? I’ve been a lifelong athlete, ever since I was a kid. The fitness industry wasn’t my chosen path until I left the military (Navy), at which point I could pursue it full-time. Spending a lot of time in school and working in health clubs was quite consuming for me so soon after leaving the military, but there was never a question of my interest in the realm of physical fitness. I had originally planned on going into the world of physical therapy, but I decided that my time as a graduate would be better served in studying kinesiology. It was certainly the right move for me. From the age of 12, weight training was the primary focus of my fitness routine. I didn’t really integrate the serious bodyweight stuff into my routine until around 2006, and in 2007 I started a system that married various movements synergistically. The careful orchestration of calisthenics, marital arts, dance, and other variations of physical culture would percolate into what is now known as: The Body Practice. IS THERE SOMETHING IN YOUR TRAINING THAT YOU DO ON A DAILY BASIS AND COULDN’T DO WITHOUT? 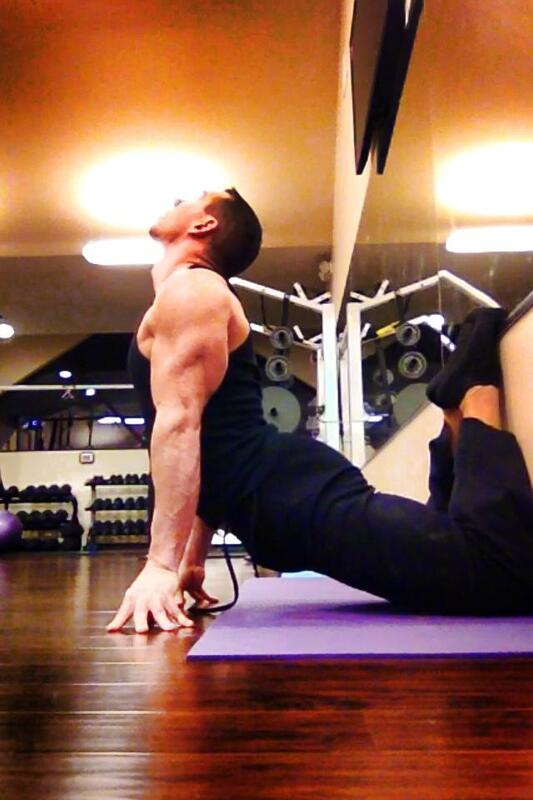 I cannot function without my basic mobility and inversion templates that I practice daily. These simple templates that I’ve created for myself keep me functioning at a high level of health and ability. While there are several things I do in a day of training, practicing mobility and getting upside-down are ‘musts’ for me. Without these I honestly believe I couldn’t practice what I love the most, which is training hand-to-hand. The learning curve of hand-to-hand (not simple adagio balance, but specifically hand-to-hand) is steep. The advantages of suppleness and balance helped fill the gaps in areas where I was lacking. WHAT DOES YOUR TRAINING LOOK LIKE? DO YOU USE ONLY BODYWEIGHT EXERCISES? DO YOU PERIODIZE YOUR TRAINING, ETC? HOW DO YOU TAILOR YOUR TRAINING SO THAT YOU REACH YOUR GOALS? A typical day starts with indoor interval cycling, followed by some passive stretching. 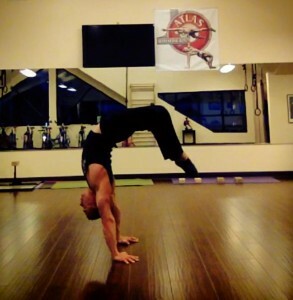 In the morning I train the bulk of my mobility/flexibility work, along with priming my hand balancing. Priming is a term that I use to identify only around 5-10 sets of handstand work in preparation for the stuff in the afternoon. The afternoon starts with hand-to-hand practice for The Atlas Brothers. I will then go on with full-on hand balancing (finger balancing), canes, floor, and fingers. I will finish up with weight training and isolation movements with remedial application to close out my day. I apply a kaizen philosophy in my training. Marginal but consistent growth and evolution has proven to be the most successful way for me to train many things at once. You can only expect to have so much improvement in all areas, and the kaizen philosophy has kept me moving forward. Fortunately, I am a patient man. When I reach the goals that I set out to accomplish, I move on to the next challenge. Periodization isn’t used much in my system because it’s so customized to my own body. I make adjustments on the fly without waiting one, three or six more weeks to pass. At 40 years old, I’ve become acutely in-tune with when and how things need to be changed with this body of mine. When I set a goal for myself, I first determine my starting point, current work capacity (which is specific to the goal I’m going after) and the protocol to get there. I may find that as I’m going through the training I may need more or less rest in order to reach the highest possible level of training efficacy. Although I lay out a protocol, it never trumps the biofeedback given by my body. THERE ARE SO MANY HOURS IN A DAY. HOW DO YOU CONTINUE TO PROGRESS IN THE AREAS OF MUSCULAR STRENGTH, SIZE, BALANCE AND FLEXIBILITY, SIMULTANEOUSLY? The ultimate choice! Personally, the physical attributes I train are prioritized in the following order: hand-to-hand, personal goals in hand balancing, and then aesthetics through weight training. I don’t train things that will sabotage my training with my brother (as The Atlas Brothers) as that is the most important element of my training. We are paid to perform strong and to look good (it’s not enough to have ability alone; you need a strong physical presence). 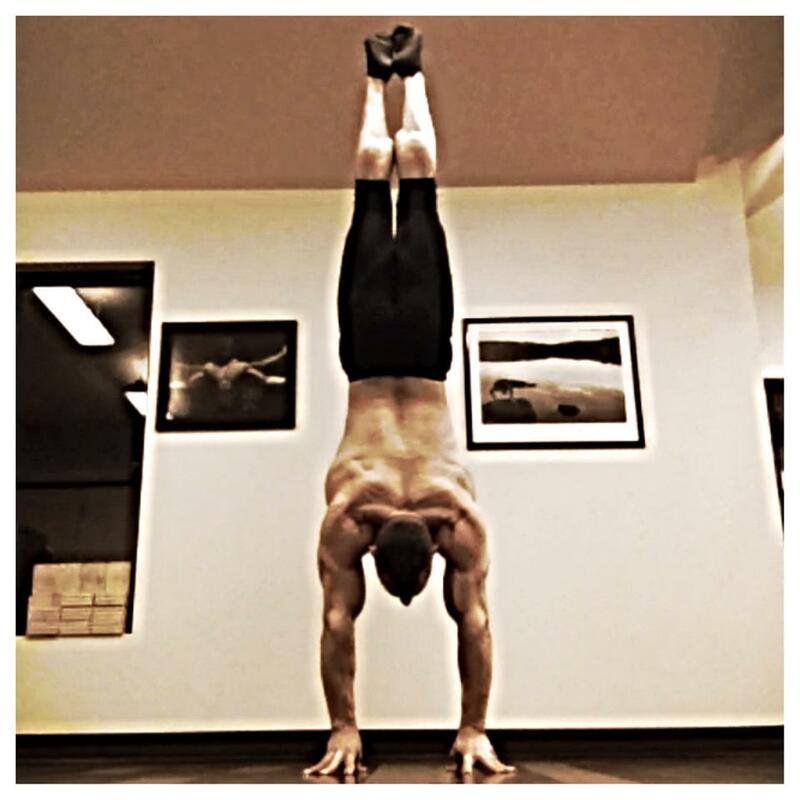 Secondarily, my hand balancing takes up a lot of my training time. Fingertip training is something I don’t really see anyone training over 200lbs, but the challenge is there and so is the ability to engage in such things. The fact that I own a state of the art training studio with high ceilings and a clean Zen feel provides all the opportunities to achieve the things I’m going after. If I had a factory job, forget it! There’s no practical way I’d have the time to train it all. I have an entire day to balance my physical attributes in my studio, and I realize that I am in a minority there. Still, I’ve witnessed people that train a LOT that still have regular full-time jobs. Their success is contingent upon many factors but the most important is one that they all share; a strong desire to succeed. LET’S TALK ABOUT DIET. WHAT DO YOU EAT ON A DAILY BASIS? WHAT DO YOU STAY AWAY FROM? DO YOU COUNT CALORIES OR MACRONUTRIENTS? My approach to nutrition is a kind of stylized Paleo, which is simply to say that I am not Paleo all the time. I consume a lot of animal protein, vegetables and fruits, but I also consume a shake for breakfast in the morning with almond milk, whey isolate, organic power greens, organic flax seed oil, lecithin, and a host of vitamins to start my day. At times I will consume a treat such as pizza or a hamburger, but not often. This is not remotely the norm. If you’re going to be really lean and muscular at 40, you have to have your nutrition dialled-in. The ability to slack on your diet and be rock hard in your twenties is hardly any work in comparison. My supplement stack includes: a probiotic, a multi-vitamin, flax and fish oil, BCAAs, L-Glutamine, Lecithin, Taurine, Tyrosine, Glutathione, and although they’re not supplements, unflavored/unsweetened green tea and a lot of water! Unless it’s a special occasion, I avoid breads, cereals and grain foods. Candy and other garbage is not even on the radar; I have no cravings at all for these foods. I don’t count my calories or macronutrients anymore, because after monitoring my food for some time I’ve learned the formula that works best for my body. WHAT IS YOUR PHILOSOPHY ON USING JUST BODYWEIGHT EXERCISES FOR MASS-BUILDING? CAN IT BE DONE? IF SO, HOW? IF NOT, WHY NOT? Bodyweight exercise can build mass, but it’s subjective. Load, intensity and exercise type, combined with genetic predisposition, all weigh-in on whether a person can gain muscular mass from bodyweight training. I was not as big when training strictly with bodyweight work for 3-5 hours per day. 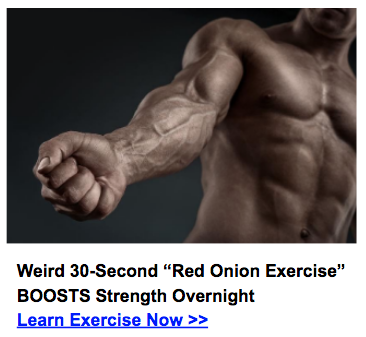 I did, however, enjoy the shape, definition and muscle hardness that came from bodyweight strength work. On the other hand, I have seen people duplicate my protocols in subjects 6 inches shorter and 50lbs lighter, and they seemed to pack on mass almost immediately. As you can see, it is subjective to the situation of each individual. After coaching for 20 years, I can identify whether a person is genetically predisposed as a mesomorph body type. With that predisposition, using a good protocol for bodyweight training can easily add mass and quality musculature. 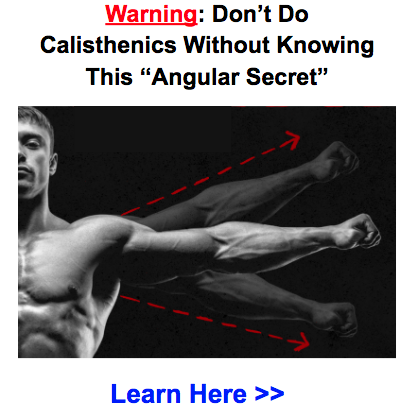 WHY ARE YOU DRAWN TOWARDS BODYWEIGHT TRAINING? For me, the personal draw towards body weight training is simple: the challenge! It’s far more challenging to coordinate and master the body than it is to move an external object along a particular plane of movement. It’s engaging, and typically involves multi-joint movements that reward the body in so many ways. I couldn’t possibly give up bodyweight exercise. WE HAVE A LOT OF PEOPLE LEARNING HANDSTAND RIGHT NOW, WHAT WOULD BE YOUR BIGGEST SUGGESTION TO THEM SO THAT THEY CONTINUE TO PROGRESS? Instruction in handstanding is crucial. I see people practicing all the time but their form is dogs*** and no one seems to care. Typically this is because those in their training circle are none the wiser. WHAT IS THE BODY PRACTICE? HOW DO YOU STRUCTURE THE PROGRAM AND WHO ARE YOU TRYING TO REACH? The Body Practice is the location and name of my business here in Spokane, WA, but it’s also a system of various movements (calisthenics, dance, martial arts, etc) that have been fused together to flow in an interval formation. It can be taught in personal (one-on-one training) or group classes. The main way to quantify the value of TBP is not in the total output of a workout, but in the quality and mindfulness of the movements performed. Training people to sustain efforts for the duration of a minute is a pretty new concept when you consider that people are typically learning something that is completed in less than 30 seconds. As an example, one of the elements in the master’s edition is the handstand. Like all the other elements, it is expected (or the goal is) to be in handstand for the entire 60 seconds. This is clearly not an easy task, which is why this is called The Body Practice (Series 3) the ‘Master’s Edition’. The system has beginner, intermediate, advanced, athlete, and master’s edition DVDs, along with restorative yoga discs. I am currently working on the next DVD that will bring in structured training protocols for strength work: The Body Practice (Series 4) Strength! Since TBP is scaled for almost all levels of fitness and is replicable in exercise translation, I created a two-year certification program for those wanting to have authorized accreditation of this system and my personal endorsement. This is not a weekend or week-long workshop. Teaching people the myriad movements of TBP, its training protocol, its yoga, and its transferability to people in a private or group setting is a long process. The accreditation is earned by attending and participating in workshops, immersions, training sessions, and online coaching sessions. Students have up to two years to complete the course and test for their final exam. There are five amazing people that I have certified in this system so far and more are on the way! Facebook has been amazing in proliferating the Body Practice movement. I have sold DVDs in over 25 countries around the world. Facebook is my primary tool to reach new viewers and provide the system of quality movement in personal practice that I hold so dear to my heart. Find The Body Practice on Facebook. Also check out Steve Atlas and The Body Practice’s fan page. I broke my neck .I also had a brain operation. Also a colon operation. I walk with a walker. I am 75 years old. I came across your blog. Its really nice and very useful information.